(Second Viewing, On DVD, September 2016) I remember seeing Dante’s Peak in theatres and being quite a bit impressed at the special effects, town destruction and convincing re-creation of a major volcanic eruption. (I also had a bit of a crush on Linda Hamilton, so that helped.) Nearly twenty years later, given the constant evolution of CGI, would the film hold up? As it turns out, the special effects mostly do … but the overall pacing doesn’t hold up as well. 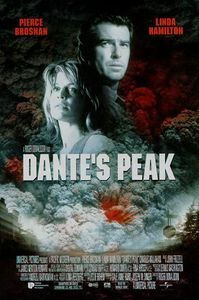 Faithfully following the disaster-movie template, Dante’s Peak does struggle to find something to do in-between its spectacular (if depressing) opening sequence and the final all-out volcanic destruction of a small northwestern town. Pierce Brosnan is cool and capable as the volcanologist crying wolf, while Hamilton is credible as the small-town mayor listening to him, but the script doesn’t quite know how to create attachment to the smaller characters or keep up the tension beyond small-town drama mechanics first well-worn in Jaws. Once the volcano erupts, though, things improve sharply. The practical effects used to simulate the destruction of the town still look relatively good (even though we’ve grown accustomed to the all-out chaos made possible with CGI) and the sweeping shots of a town being buried under ash do carry a certain majesty. Director Roger Donaldson is most in his element when showcasing natural mayhem, and sequences such as the bridge passage are as good as Dante’s Peak ever gets. The ending is a bit more intense and claustrophobic than I remembered (thankfully quickly moving on to the coda) and if the film doesn’t quite hold up as a complete success, it’s still good enough to make audiences happy, especially if they can muster a bit of nostalgia for mid-nineties catastrophe films.